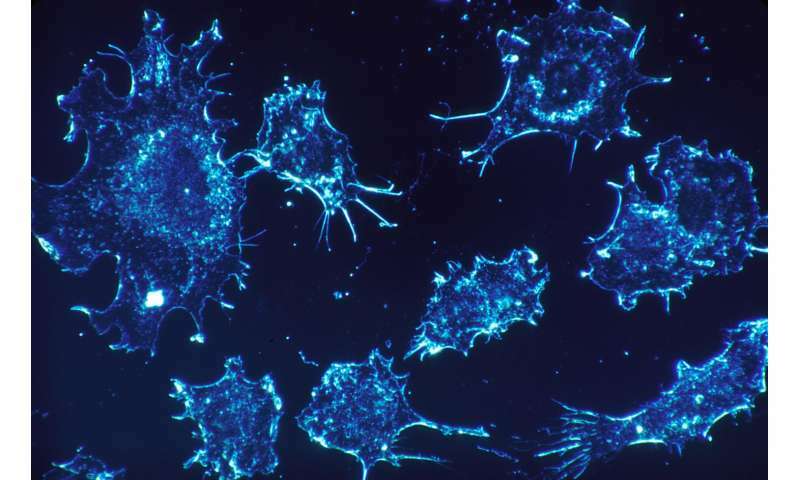 Targeting healthy cells that have been hijacked by cancer cells could help treat many different types of the disease, according to research funded by Cancer Research UK and published in the Journal of the National Cancer Institute today. Scientists found that targeting an enzyme known as NOX4 stops the action of a type of cell called cancer associated fibroblasts (CAFs), reducing the size of tumours in mice by up to 50 per cent. In line with previous studies, the team at the University of Southampton found that higher levels of CAFs were associated with poorer survival in several cancers including bowel, head and neck cancers. For the first time, they identified that NOX4 is needed for CAFs to form and help tumours grow in many cancer types. But they could stop this happening by blocking NOX4 using a drug that is being developed to treat a condition called organ fibrosis. These findings could form the basis for new treatments and help make cancers respond better to existing drugs. Cancer Research UK is now funding the Southampton scientists to see if this approach improves treatments like immunotherapy and chemotherapy to make them more effective. Professor Gareth Thomas, lead researcher and Chair of Experimental Pathology at the University of Southampton, said: "By looking at many types of cancer, we have identified a common mechanism responsible for CAF formation in tumours. "These cells make cancers aggressive and difficult to treat, and we can see exciting possibilities for targeting CAFs in many patients who don't respond well to existing therapies." Dr Áine McCarthy, Cancer Research UK's senior science information officer, said: "Some cancers are incredibly difficult to treat, and can use the body's own cells to help them grow, evade treatment and spread around the body. Researchers have been trying to unlock the secrets behind this for many years and this study is a big step forward in understanding how some cancers achieve this. "These findings show that CAFs can be targeted with a drug and their 'pro-tumour' effects can be reversed in mice, giving researchers a starting point to develop new and potentially more effective treatments in the future." More information: Hanley, C, J., et al., Targeting the myofibroblastic cancer-associated fibroblast phenotype through inhibition of NOX4. Journal of the National Cancer Institute.